The number fifty-five had a double meaning in New York City on December 6—it marked not only the fifty-fifth time that TEI’s New York Chapter held its annual tax symposium, but also the chapter’s celebration of the fifty-five years that Peter Faber of McDermott Will & Emery has served the tax community. A longtime contributor to the chapter’s state and local tax (SALT) activities, and the author of countless articles on SALT and other tax topics, Faber announced his retirement, effective at the end of 2018. 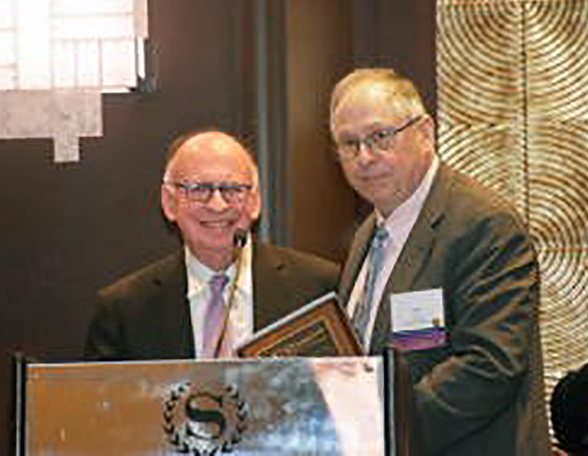 TEI used the occasion of its annual symposium to thank Faber for his support and to present him with the New York Chapter’s Distinguished Service Award. The annual tax symposium is a premier tax conference held annually by the New York Chapter in midtown Manhattan. This year’s program was presided over by Bruce Maggin, chapter president, and superbly coordinated by Linda Klang, with help from members of the chapter’s three technical and corporate tax management committees. Twenty-five firms generously sponsored the conference, which offered three concurrent sessions of federal, state and local, and international technical sessions, a formal luncheon, and a reception. Lisa Samuels, TEI’s director of marketing and communications, was on hand throughout the day, answering questions regarding TEI membership and signing up new TEI individual members. Also participating in the conference were guests from the Internal Revenue Service, including Chris Morel, a local taxpayer advocate who leads thirty taxpayer advocates in the IRS Brookhaven Service Center. John Orr presented Faber with the award at the symposium luncheon, where attendees included TEI members, speakers, guests from the IRS and state and local governments, and representatives of the twenty-five sponsor firms. Following the presentation, Faber delivered a heartfelt acceptance speech in which he reflected on his fifty-five years of practicing tax law. He spoke of many things that TEI as an organization embraces, such as diversity, good relationships with government officials, and service to the tax community.